Actually, DD and I made it. 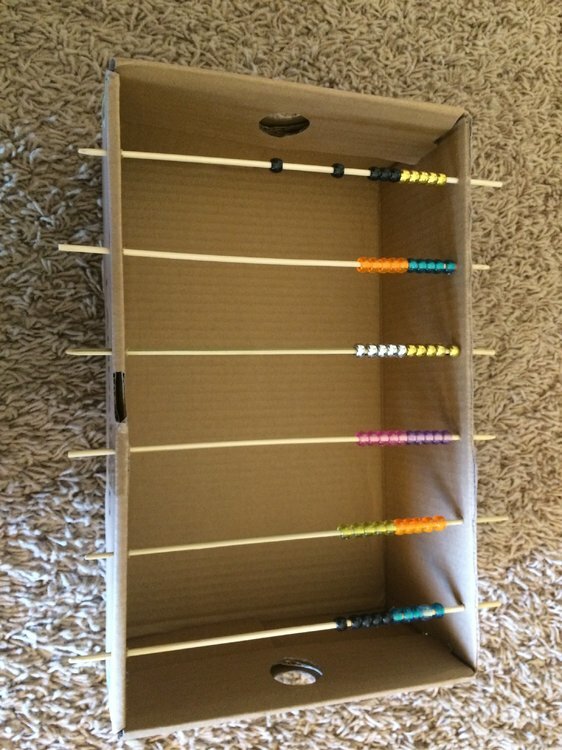 I jumped ship from Saxon 8/7 to Principles of Mathematics book 1, and she wants the student to use an abacus, bought, online or homemade. We don’t have a bought one and I thought the online one wouldn’t be as good for DD as an actual physical one, but I thought the homemade version in the book was too much trouble, plus required buying a picture frame and some wire. i was so proud of myself when I thought of this last night. A shoebox, some bamboo skewers, and pony beads. All things I had on hand, so basically free (and I am always happy to get rid of a few skewers, I first bought the package at least 3 years ago). Anyway, thought this might be useful if anyone wants an abacus for occasional use, but doesn’t actually want to spend the money for a “real” abacus. Nice! I love home made school stuff. We made an asian-style abacus out of skewers, craft sticks and pony beads (like this one). Yours looks much quicker to make. It was quick. About 15 minutes, I think. Not as cute as those you linked, though. I do think you could make a shoebox one Asian style by glueing or wiring another skewer vertically across the horizontal skewers. my DH, though he has never read or watched Kon Marie, is very much in sympathy with her methods.